Arizona, 10/09/08: Today, Western Watersheds Project and WildEarth Guardians filed a petition requesting that the U.S. Fish and Wildlife Service (USFWS) list the Sonoran desert tortoise population under the Endangered Species Act and designate critical habitat to protect the animal. The Sonoran desert tortoise population has declined by 51% since 1987. Severe population declines were documented in a recently completed report. The study found that monitored desert tortoise populations are declining by about 3.5% per year throughout southwestern Arizona. Although to the untrained eye they may look similar, Sonoran desert tortoises show marked genetic and behavioral differences from tortoises found in the Mojave Desert. The Mojave Desert population was listed as threatened under the Endangered Species Act in 1990.
provides,” stated Dr. Nicole Rosmarino of WildEarth Guardians. protected to aid the conservation and recovery of the species. Is there another electronic copy of the petition somewhere, or at least the Boarman Kristan 2008 paper (Appendix 3)? Some of the tables were printed in landscape and not turned sideways, so are cut off. My wife and I had the great pleasure of spending the weekend with Michael Connor, who compiled this petition, and I feel that he is to greatly commended for this work. Recently he has helped me a great deal with my new line of work and I am very happy that I have the pleasure of working with him. Great guy. This is a very important petition and, if successful, will have far reaching impacts on public lands management. This is great and important work. Kudos to all involved and to Dr. Mike Connor for his wonderful work. Fighting the good fight as always. Good ol’ Western Watersheds. Great cover shot on that petition. The tortoise is chomping down on a yellow flower petal. Keep in mind that habitat of the desert toroise is the same habitat people would like to stick solar grids in….yet again an example of choices that will cause upheaval—what is the lesser of two evils??? Maybe the current lack of capital will cause a rethinking of the giant solar farms. Solar energy should be generated near the point of use, such as on top of big box stores and other surfaces that do not get foot or other traffic. The electrical utilities, however, don’t like small scale generation because they don’t like to have to pick it up on their transmission lines. During the energy crisis days of Jimmy Carter, small sources of electricity faced the same problem. However, the utilities were forced to pick them up and even to pay avoided cost. Of course, turning solar energy into electricity is only one way of using the sun. Using the sun to heat water is much more efficient than using natural gas or electricity to heat it. Once again, centralized power generation requires lots of security, and so it is harmful to democracy as well as the environment. Solar farms are fenced to keep people and all forms of wildlife out. I understand the land is scraped bare so nothing will grow. This will have a very adverse affect on carbon sequestration by the soil. I’ll bet few thought that solar power could result in an increase in CO2 emissions. You are absolutely right. Who would’ve thought? With ever increasing production of solar powered inventions, I’d say the time is not far away that we will see more tiles on roof tops everywhere. I spoke with a fellow last week who had solar, and due to the high maintenence costs, couldn’t use them. I suppose that could become less prevalent soon, as we are moving forward with alternatives. I would love to see a move to putting solar on school and government roof tops, heck through some turbines in the back too. They’d make my decade if they required a conversion to hybrid government vehicles…through in taxis having to convert within ten years and I am doing back flips in the front yard. Oil companies would have us believe that we will lose jobs. I know we’d create many more new jobs, factory assembly of panels, tiles, turbines….people who can service and install new energy sources, and workers to assemble all those government hybrids. Not to mention people who could recycle all the building materials and old cars. These things are very relevant. But no one wants to deal with the obvious….we have to go to local supply. Aside from the reasons you list, it is necessary because it is far easier to trasition that way. It is far less of a shock to the economy or the people of this country. Since we now water heating via solar is very cost effective (My 4th grade science fair project was building a solar water heater, and comparing it to other sources of hot water, like gas an electric…loved it….made me a believer.) Could we not use this as a thermal energy source? Would it also have a heating effect on the planet? I meant who would’ve thought solar could be damaging too. Sorry for the wording Ralph. another important thing to note about solar farms is that the land degradation/impact associated with construction of these giant “renewable” (hardly – if you’re a desert tortoise) utilities mitigates the carbon sequestration potential of the soil and vegetation communities in these deserts. we are finding that these desert biomes can sequester as much, if not more, carbon dioxide from the atmosphere than temperate forests. In any event – the carbon sequestration potential is profound and it’s best when the systems on the landscape are intact and vibrant. this is important to consider when talking about supposedly turning the environmental consideration of renewable energy against that of habitat/species conservation. although these utilities may not emit warming gases – they decrease the system’s absorption of those gases – which is actually a net warming effect. Is it different to emit 10 units of CO2 than to eliminate the landscape’s absorption of 10 units of CO2 ? 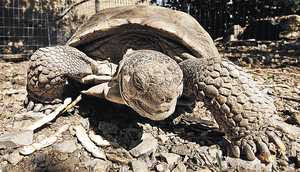 In this respect – protection of the desert tortoise could be understood to have the positive consequence of contributing to mitigation of global warming by promoting the sound habitat and healthy landscape within its range – a condition that enables and elevates the carbon sequestration attributes of the landscape. another important consideration of proposed “renewable” utilities is: i have yet to come across a proposed project that decommissions a carbon emitting power plant – that is, the so-called “renewable” giant utilities aren’t decreasing emission at all, the proposals seen are not contributing to solving our climate change crisis because we have not come to the determination that “demand” for artificially “cheap” energy ought be a subservient aim compared to addressing the problem of carbon emission and doing so sustainably. so long as there are environmental proponents that grant the idea that demand for artificially/subsidized cheap energy trumps the impact of providing it – they will be forcing themselves into defending environmental degradation, obfuscating and hindering the potential for a straight conversation about the direction that i believe energy policy ought consider if it is to be honestly “green” and sustainable (we forget that word when smooth-talked into the promise of ‘easy’ and ‘cheap’). i agree with ralph and vicki that localized utilization of renewables is the alternative that avoids this malicious suggestion that species conservation conflicts with climate change mitigation. local deployment is also the common sense alternative that gives people (not corporate utilities) energy and economic security over their own lives and communities. that’s power that fuels more than your iPod – and a level of self-determination (economically, politically, socially) that a lot of people and communities have not seen before but that we’re finding we need more and more (see: financial crisis). it’s obviously more efficient – more energy produced could be utilized rather than wasted along transmission. people and communities would also be aware of the consequences of energy production as its in their back yard – that proximity of production ameliorates into wiser choices with regard to energy use. it seems to me it’d also be a better alternative in that it models our energy infrastructure/system (the foundation of our economy) on an energy system that has been working for a very long time – that of ecology (the real foundation of our economy). localizing deployment of these technologies would in a way model ecological systems in that decentralized production of energy has a lot more potential to internalize efficiencies responsive to its immediate environment than centralized utilities. innovation (in ecology: ‘adaptation’) and diversity of technologies responsive to immediate environments and need (depending on the industry, way with which energy is used in a locality, energy inputs – sun, gravity/water, geothermal heat, wind, etc.) exists to a degree now – but the closer to use and more diverse that innovation and generation has the potential to be, the more that model can move toward efficiency and actual security – and be to benefit everyone rather than a few. that’s sustainable – and i think it promotes conditions that favor people and communities who are wise rather than the system we have now that promotes waste. unfortunately, the speculative monetary resource that accompanies folding and/or greenwashing industrial energy conglomerates is an enticing motive for some as it takes a lot less energy and effort to describe the superficial “benefits” of a centralized power plant or wind farm solving all our problems with a slick/shiny technology wastefully and excessively deployed using the same model (the systemically corrupt and wasteful model of our energy system is AS MUCH a problem as production technology) than the energy and effort it takes to ask folk to understand the benefit of intact dynamic systems and basic conservation principles. just look at the calls to reform ESA & NEPA – it’s really ridiculous and short-sighted in my view. when we look at the science – there is ample opportunity to objectively describe how enforcing and emboldening the ESA and other conservation tools already in existence – that have been at the heart of this movement for so long – is an incredibly effective and wise way of addressing climate change AND conservation of desert tortoise and other species and landscapes. in fact, these tools give us a just pause to consider ecological systems, that if we’ re wise and humble enough to listen and learn – will actually teach us ways to solve huge problems by looking at systems that have worked on this Earth and on specific landscapes for a very long time such that we can figure out how to model them in the places that we live – rather than impose shortsighted strategies that conflict/fight against our security and environment as if the place didn’t matter. a lot of this may be ‘out of the box’ – but it seems to me like we may be running through an economic, social, and perhaps political time where ways of looking at things changes very quickly. it also seems that we can solve many of these problems concurrently (i.e. desert tortoise HELPS carbon sequestration, localized renewables HELP tortoise & many other species & landscapes WHILE helping people economically, socially, politically, etc.) and that solutions that DO MORE WITH LESS may be a lot more palatable than we have been used to before. This work with the sonoran desert tortoise is good work that forces the government to consider their value. it’ll be interesting to see how FWS is responsive. Yes, Brian is right. The old models of centralized “production” and control of energy are the dead opposite of where we need to go for sustainability and “security” – including individual American’s financial security from energy pricing by rapacious industrial giants and speculators ranging from Enron to Shell to whoever Big Solar is. Well, considering our electricity demands increase every year, what sources of new energy do you guys prefer? Drill more oil in ANWR and offshore? Drill for more natural gas on public lands? How about massive wind farms instead? How about constructing new dams? And don’t say “conservation of energy.” With a constantly increasing population and constantly increasing electrical consumption per capita, conservation of energy is part of any solution…..but it’s NOT the sole answer. It simply cannot meet future demands alone. I think if you fight every new source of energy, you will find yourself very quickly on the outside looking in. How can anyone take you seriously on energy if your answer to every energy question is a simple “NO”? demand increases when energy prices decrease – the opposite is also true. energy is wasted in production – through transit – at the point of use – both with inefficient technology AND at that place where both you and i use it when we really know we don’t need to be using it — that last reason expands and grows when our behaviors and habits are cultivated by the lie of “cheap energy” and we have become accustomed to paying a dishonestly low price at the utility because of the externality costs that we DO PAY but that we don’t associate with our energy choices because we pay them in other ways (i.e. wars, environmental degradation, subsidies, etc. you’ve heard it all from me before). If a market is to work – it needs to be honest. That’s the “YES”/alternative. We saw what happened with demand when the price went high on fuel. demand went down – people made different choices. The more honest the market is about the actual cost of energy – the more likely the solutions we look for will be efficient. “NO” is the correct answer to one who asks to churn more of our natural resources – other resources upon which we are ultimately just as dependent as that of our atmosphere – into this economic and political lie that lets us believe it’s cheap – but forgets to tell us it’s not sustainable. It’s not that renewables are bad – in fact, renewables have the potential to advance our relationship to the environment, our individual security and freedom, our collective security and freedom, and more in ways that will change everything. However, when you give the same liars and crooks who have made their industry obfuscating the true cost of the market choice to consume energy (does anyone believe that the market they built is on any more sound ground than the market we’re all paying attention to right now) – when you give these crooked markets the reigns over how to deploy these promising technologies – then you’re making a mistake. That’s what’s happening in the Mojave, on Brown’s Bench, and in a whole lot of other “markets” that we used to call public lands across the West. I’m not so sure about that… it seems to me like a lot of things are changing, or that opportunity is happening – and even if what you say were true, who’s gunna stay outside to remind us what the wildlife and landscape’s are like ? Because folk were outside and remember what the wildlife and landscape’s are like – and it seems to me like when it comes to being taken seriously about advancing conservation of those things – it’s a pretty important thing. Because the answer to every energy question is not “NO” – sorta like the answer to every energy question ought not be “YES” even as this would be just as easily projected onto a person’s position to “discredit” them. The desert tortoise deserves to live in its habitat for many reasons. Other species and landscapes for many reasons too. We need to find a way to represent that in the energy choices that we make rather than ignore it in a rush to keep some addictive fix – because the energy choices affect the desert tortoise, other species, landscapes, us and future generations too. Decentralized deployment of renewables is one alternative – bringing honesty of actual cost back to the market and encouraging innovation in conservation and efficiency technologies is another — that’s 2 “YES” answers among infinite others that are sustainable. Sometimes it takes a few “NO”s to get people to see that the box of options that they had was a lot smaller than it had to be, and that ironically, the folks saying “NO” were actually opening others’ eyes to all the “YES” answers that there could be that worked out best for everyone – except the crooks who built the deck of cards. The biggest concern I have about tapping our own resources is that it will GET RID of the sense of urgency we now have (and need to have!) as a nation to develop renewable fuels to bring us into the next century. Americans are exactly like irresponsible teenagers — if everything is going OK, living at home with Mom and Dad who are paying most of our bills, our grades are not so good — but, hey, it hasn’t affected our lifestyle yet, why change? Then boom — all of a sudden, you’re out on your own and get a sense of the REAL world. It’s being utterly UNPREPARED for the future — the School of Hard Knocks. Seems like most Americans can’t think or plan ahead much beyond a day or two. As is usual, you make some good points. This may be true to a certain extent, but the U.S. is projected to have something close to 400 million residents in another few decades. Where will their energy come from? Right now, as I write this, 100 new coal-fired power plants are under construction to meet that future demand. I am sure they will build another 100 when those are completed. My point is that regardless of our personal beliefs, the world still turns every day, and we are going to increase our supplies of energy because the world’s population grows by about 250,000 a day. EVERY day. The question isn’t about changing our energy markets, denying that future energy demand is going to increase with our population, or any other red herrings. The question is quite simple: where do we want our future supplies to come from? Make no mistake, we are going to produce more energy. And if not, what are those 100 brand new coal-fired power plants going to do? Just sit there? Does anyone actually think those will be the last coal-fired plants we will ever build? I agree that our current market is not honest. There are a multitude of true costs that are not factored into the price of any source of energy. However, under our economic system, this is basically true of almost all of our industries. I honestly would like to change that, but considering it hasn’t changed in our 230 year history, and virtually no one is talking about it, I won’t hold my breath and hope it magically happens. I again agree that our energy consumption is not sustainable. Once our civilization converted from a society based upon wood, to one of coal, and then to one based on oil and gas, sustainability was left far behind. But, again, this will not stop energy development. Otherwise, we wouldn’t be constructing new power plants, proposing new nuclear plants, developing solar technology, drilling offshore for oil in areas that until just recently were off-limits, and developing new gas fields as fast as we can. So, faced with the inevitably of energy development, I think the choices are stark and obvious: where do you want future energy sources to come from? “NO” is not an answer. It will come from somewhere, make no mistake. In my opinion, solar and wind present the best options for many reasons. Will there be a high price to pay environmentally for solar and wind? You betcha. But how much higher will the price be if instead we perpetually build new coal-fired power plants, new nuclear power plants, and drill for natural gas on every acre where it’s accessible? All energy production is destructive and harmful. Currently, we are married to the worst kinds of energy, and we desperately need to change that. Solar and wind are the very best options for the future. Unless you can envision a U.S. that voluntarily stops using electricity and oil. I certainly can’t. Quite the opposite, actually. In 2050, when there are 450 million Americans, I find it impossible to believe that we will be utilizing less energy than we do today. Can you agree that in the future we will be using more energy than we are now? If so, how do you propose producing that energy to meet future demands? The best answer: solar and wind, of course. The answer isn’t 100 new coal-fired power plants coming online as I write this. But that’s what we are getting. How can you not support a better alternative? I have asked these questions myself. The answer becomes more and more clear. We cannot quit our dependencey on energy (oil, gas, coal or electric) cold turkey. It is an impossible feat. I believe we will have to drill here to secure our nation’s economy and safety. But we have to do that with extreme regulation and a definitive time line. It will not lower costs, and should not. We have to keep Americans aware that oil is at it’s end. In the interim, we must begin a very vigorous transition to small grid energy sources. As Brian has stated, it is more efficient, cleaner and more cost effective. It also lessens the shock and symptoms of withdraw that our country will surely experience. There needs to be a comprehensive plan in place to convert government building’s utilities to independence….put solar on roof tops and turbines in court yards and on college campuses. (Some colleges like Colorado University are already converting.) We need to have a plan to phase out government vehicles that are not hybrids. We need to have new jobs created in new energy sectors. We need to make energy choices available. There should be a law that requires all new buildings to be a certain percentage renewable, and sustainable, to pass zoning. We should never lose sight of what energy really costs, which is so much more than dollars. We have to see alternatives for what they are, and recognize the consequences involved in using them…unlike the mess we have made with oil, we need to look at what we could be harming. Then we should make the very best possible choice about how, and where to impliment any type of factory or large scale grids. I am strongly in support of wind and solar….but not if it is just advocating another irresponsible trend. We cannot continue to grow dependent on energy that leaves us to repair and live with horrible consequences. We cannot blindly move forward only to have to look back with regret. We need to put the alternative energy sources in places that we know will cause the least harm. Since roof tops already exist, and backyards are already settled…why not there? It would seem most logical and the least invasive way to go. If you abandon one species, you devalue all species. Every speciesl is worthy or our concern, consideration, and protection. It is easier to prevent a problem than to fix one. Good post, Vicki. You make some excellent points. I agree 100%. These should be bridges until we develop the capacity to power our homes with solar and wind, and phase out internal combustion powered vehicles. The problem with this, at least for the time being, is that it is cost-prohibitive to erect solar panels on rooftops. For one house, you are looking at $30,000-$40,000. It will be 20-25 years before you even break even. And with our national debt over $10 TRILLION, and housing values dropping, where would all that money come from? It simply is not economically feasible at this time, although it would be a huge step forward if we could do that. It would alleviate so much demand that we could stop building new coal-fired plants. What we desperately need is a sincere, exhaustive, and well-financed effort to reduce the costs of solar power to make it feasible to do just what you suggest. We are still selling 15 million motor vehicles a year that are running on conventional internal combustion engines. This is shameful. Almost every car or truck sold in the U.S. should be a hybrid by now. If we had political and industry leaders that actually possessed foresight and weren’t beholden to the automakers, we could have been far down the road to accomplishing this by now. We are moving much too slow on hybrid vehicle progress. This is so true. We hear politicians put energy in terms of national security, yet they never inform us of the true environmental costs of energy. On a related note, until just recently, the Republican Party denied the realities of climate change. That has proven to be quite a huge hurdle in the way of getting the public behind alternative energy and hybrid technology. If we all realized how dire the situation actually was, public support for some of this thread’s proposals would have been strong enough to have a very large and positive impact. I love and respect all species, just like most on this blog. I lived on the border on the Great Smoky Mts Nat’l Park solely to study and learn about it’s flora and fauna. I love the fungi, insects, mammals, birds, trees, and every other living thing in those mts. That place is a treasure trove of biology, and some of my happiest days were spent in those hills. I certainly wish this respect and love of all forms of life that you and I share extended to all Americans, and we wouldn’t have nearly the number of severe environmental problems that are currently facing us. The key to the affordability is what our government is proving so good at….flooding the market. I think maybe one option is to mandate programs for the utility comapnies—easily done since they all fall under the rule of the Public Utility Commission.. Individuals will not be able to immediately afford to convert, that will be a transition that will have to begin with regulating new building. It is easier and cheaper to have “hybrid” building from the start than to convert it after the fact. But we could require that utility companies begin to convert their offices, and then public buildings they service. Give them a mandate on how and by when. It is unlikely that people will afford to convert….so why not have the utility companies transition to maintaining and providing small grid alternatives. To off set the losses they will incur when America is truly off the big grids, they could ‘rent to own’ the panels and turbines. That could come with contracts that provide for maintainance after purchase. Thus assuring their income far into the future. per home we would calculate the average monthly utility bill (they do this anyhow. )…this would be a somewhat reasonable assesment as it would be a lesser cost to provide alternatives to smaller houses, and smaller houses have smaller energy costs (or should anyhow). Then you estimate the cost of conversion. The government should give a credit to be applied directly to this cost. It should be to pay interest to the utility that would be paying and accruing debt to supply the conversion (materials and labor). Then you figure in the credit, and break down the energy conversion cost so that it stays about the same as the average monthly utility bill….multiplied by the number of months it would take to pay off the bill. Have this contract have a clause that says that the consumer would then pay a monthly fee for maintainence for a five year (just a number for use in the model) period…or purchase option for a warranty. Ofcourse this will only work in homes that are being purchased or owned out-right. you could apply it to rental properties, but those homes and buildings would fall to the landlord’s responsibility as far as contracting goes. The government could recoupe their money very quickly by providing government plants that sell panels, or even just by helping manufacturers with loans to start plants to mass produce panels. There would always be a demand as they would need replaced or need up-graded or parts, etc. Sort of like what they do with student loans…invest in the future tax dollars that those who participate will supply, and the money they would make from the lenders on loans that are guaranteed. Just some food for thought….but some models should be thought of and then choices could be made. As far as hybrid vehicles, Toyota had repored lastyear that they cannot keep up with demand on their Prius line, they have a new model that will get @80 mpg set to come out. The price of the vehicle is going to be much higher. If the government really wants to create jobs….why not revive the failing U.S. car industry by helping them to convert their plants and technology..GMC could use a jolt forward. That would increase supply therefore lessening costs and creating a more affordable market to consumers. (Sort of like what Hyundai did back in the day when they flooded our auto economy with cheaper four cylinder cars). The government could even require they produce X amount of government service vehicles at cost, as part of the package to help them out. I am sure you do love and respect all species. I have read your defence of them in the past. Your questions are valid, and your opinion is respected….and appreciated. I agree there should be laws for new buildings to pass zoning and they would need to be federal. Actually, the market is driving more of the newer buildings to be built in a sustainable manner. A bigger problem actually is the OLDER buildings and there are many more of those, so laws would have to essentially “force” current owners of older buildings to comply. That is going to be very expensive to do and difficult to accomplish unless there is some kind of tax credit, etc. What really kills me is when I see new developments on “virgin” land when there are older abandoned buildings. Developers don’t want to deal with the older buildings as they know they are more expensive to re-do. They can make more profit on building new buildings. It doesn’t make sense environmentally but from a purely $$ bottom line, that’s ALL they look at. BTW, my sister in law works in the Detroit area for General Motors as an engineering manager. She says our current laws actually FAVOR foreign auto makers. This is outrageous. I don’t know specifically how — we never got into the details. Next time I talk to her, I’ll find out how! It would be nice if these great solutions that are being discussed were really green. Unfortunately we tend to look at these things with a very narrow focus. There is not much “green” about the manufacture or disposal of solar equipment or a Prius either. Establishing total environmental impact from the creation of the construction materials used to the full recycling of the product at end of life is the only honest way to determine which energy consumption tracks are the best. 80mpg does not impress me in and of itself when it takes massive toxic batteries and hundreds of pounds of petroleum based composits to make it happen. Mike, you’re right — it’s TOTAL environmental impact — not just a few “sustainable” features! I actually work for a Denver commercial architectural design firm that focuses on sustainability. The new term is “greenwashing” where essentially “bogus” claims of being green are made — i.e., a new McMansion (it may be sustainable in some aspects BUT it’s got a huge footprint and is suburban sprawl. LEED is the most popular way of measuring sustainability where they assign “points” but even that has its problems. There’s LEED silver, gold, platinum. The new NREL in Golden is slated to be platinum or even “Zero energy” ZEB. Consumers are the ultimate driving force behind environmentalism– not the oil companies, not the auto companies, the consumers. People always seem to forget that. Companies won’t build things if they can’t sell them. 🙂 Would you? Much of the problem with a focus on consumers alone is unstable demand (not that I think you are really saying they are the only factor). Auto companies couldn’t make a profit trying to build and sell hybrids. Then when the price of gasoline soared, supply was insufficient, and the price of hybrids shot up so much that purchasing them saved the buyer little money. Now the price of gasoline has dropped. Hopefully they won’t shut down the production lines because the price will rise again, but when?